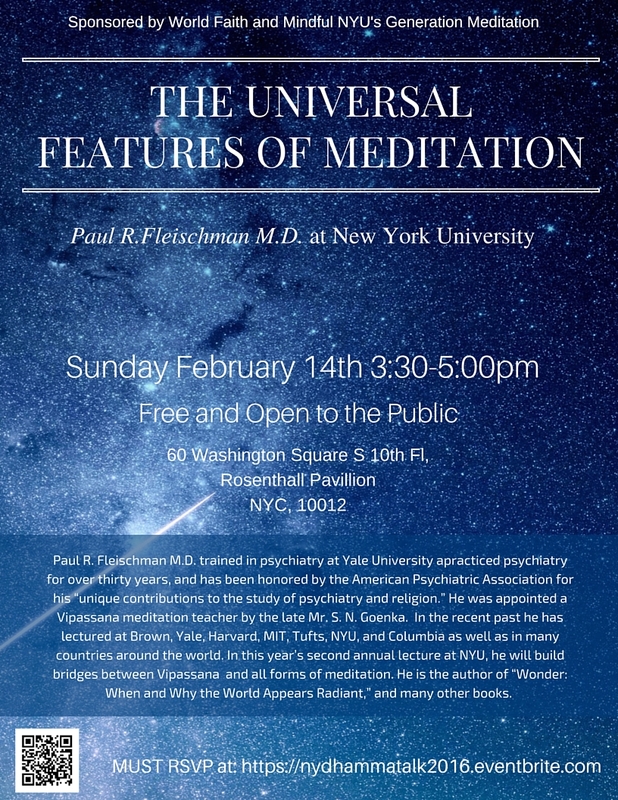 We are pleased to announce that Dr. Paul R. Fleischman, a Vipassana teacher for over thirty years, will be in New York the weekend of February 13th and 14th, to present two free lectures: One for the general public at NYU; one for old students at McKinsey and Company. Paul is a psychiatrist, an author, a poet, and has lectured in many parts of the world. To get more detailed information and register for these events, please use the links below. Sunday, February 14th, 3:30 PM. NYU is in Greenwich Village, Manhattan. This public talk is entitled "The Universal Features of Meditation;" it will be followed by a Q&A. For more information, please go to https://nydhammatalk2016.eventbrite.com. Registration will begin January 1st. If you have any additional questions about the New York events, please write to annic.ny@gmail.com. Also, for your information and interest, on Wednesday, January 20th 4:00 PM, Paul will speak at Yale University in New Haven. 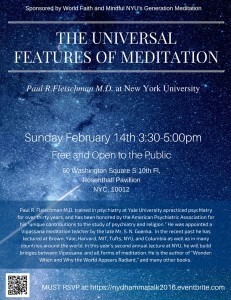 The public talk, "The Universal Features of Meditation," will be followed by a Q&A. To register, please go to: https://universal-meditation.eventbrite.com.